What is an Online Memorial? People have always created memorials to remember their loved ones and celebrate their lives. Now you and friends and relatives anywhere in the world can share precious memories by creating your own unique Online Memorial; a personalised tribute that’s a wonderful way to gather memories of someone special and allow their life to be remembered and celebrated. 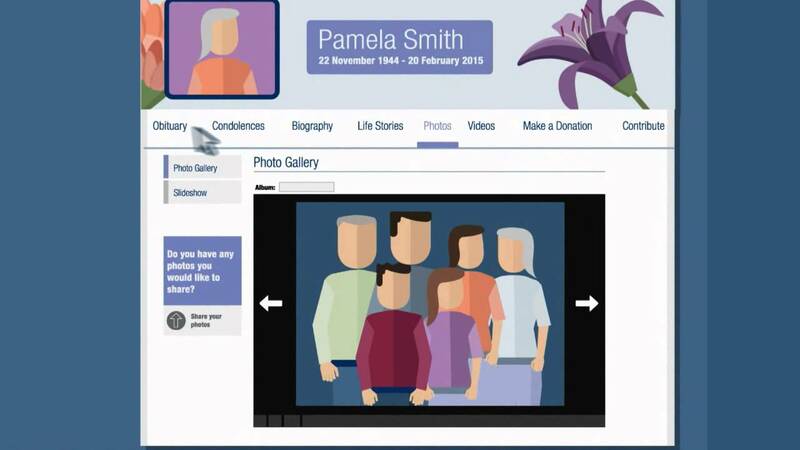 You may like to watch our animation video below for information on an Online Memorial. Creating an Online Memorial is easy, no special skills or computer experience are required. There is a simple process to follow with online help and tutorials available to assist you throughout. You can then view and share your Memorial immediately. If you are arranging a funeral with us*, your Funeral Director will explain our Online Memorials and Funeral Notices services to you. If you would like to create an Online Memorial to your loved one, (and can supply us with your email address) we will provide you with this service at no charge. Your Online Memorial will be available to you for a three month period, and should you wish to extend it further then you can choose to purchase an additional period at the end of the first three months. You decide whether to allow private or public access to your Memorial. Private access allows you and the family and friends you select to see and contribute to your site. Public access allows everyone to view the information displayed on the site. You can also choose who can share information, so that there is no concern over receiving unwanted contributions. With the exception of messages of condolence, all contributions must be approved by you before they appear on the site. Biography, photographs, videos, stories - create a unique commemoration to your loved one by adding as many stories as you wish as well as adding photographs and videos. *Online Memorials are not included when arranging a Cremation Without Ceremony.